Excellent service over the phone starts with first class phone skills. This self-paced e-learning program equips telephone agents with proven techniques to deliver stellar customer service over the phone. It is designed to lay a robust foundation of communication and soft skills by covering the topics of call structure, word choice, etiquette, and voice techniques. Prepare agents to navigate skillfully through every customer call by familiarizing them with a roadmap to effective telephone communications. From answering the phone properly, to techniques for transferring and placing a customer on hold, to closing a call positively; this course will help agents manage all facets of customer interactions in an effective and professional manner. We’ll also make sure agents become aware of the most common telephone etiquette problems and how to avoid them. Finally, we’ll outline best practices for leaving voice messages and arrange all the key elements to create professional voicemail greetings. To effectively open and close calls. To avoid the most common telephone etiquette problems and bad habits. 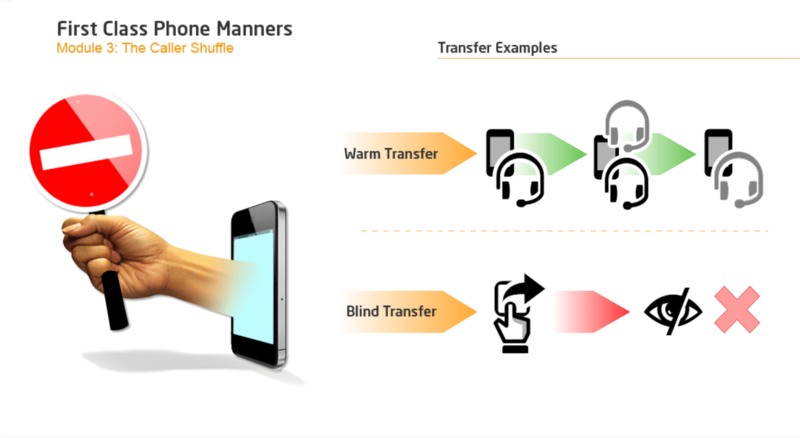 Recommended techniques for transferring callers and putting them on hold. Ways to expertly close the call to leave the customer with a positive impression. Best practices when relying on voicemail communications. To create professional voicemail greetings and voicemail messages. In this module, we'll test your knowledge of the key learning points from the course. To score a passing percentage of 80%, you must answer 16 of a possible 20 questions correctly. Good luck! What we say and how we say it can have a powerful impact on the outcome of every customer interaction. In this course agents will learn what to say and what not to say, for a positive outcome each and every time. Delivering bad news is an inevitable part of an agent’s job. Luckily, delivering bad news doesn’t always have to create a bad experience. In this interactive e-learning agents will become versed in how to say “no” in a positive manner by performing a “message makeover” by eliminating negative words and irritating phrases from their communications. Agents will acquire the vocabulary to turn negative statements into positive ones and learn how to give instructions in a helpful way in order to leave a positive impression with each customer. They will be given a guideline of words to use and words to avoid on every customer call. In addition, the will become skilled in identifying caller communication styles and selecting the best phrases to build rapport with your customers. The end result will be callers who leave with a positive impression of the agent and your company. To select the right words to convey a message. 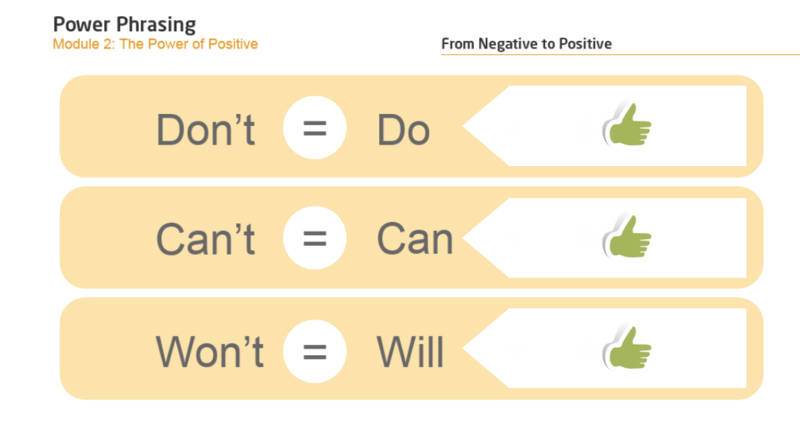 To avoid negative phrases and wording and replace with positive phrases. Key phrases that help build rapport with each customer. Visual words and phrases that can be used to replace body language to demonstrate interest and support. Ways to keep a call on track and arrive at a positive outcome. If used properly, one’s voice can have a huge impact on customer satisfaction. 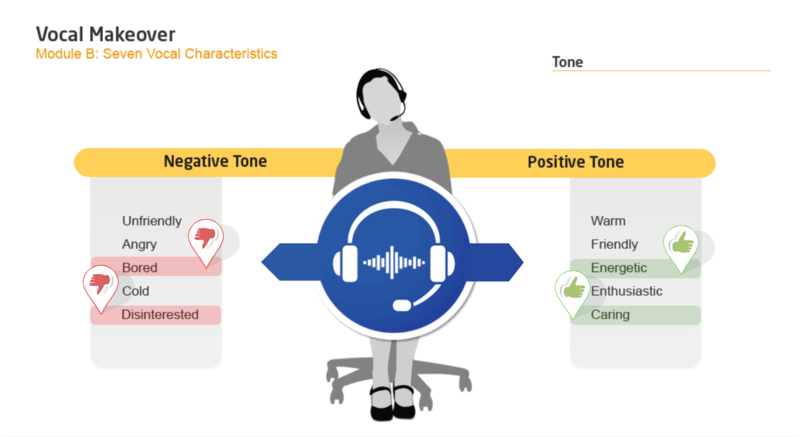 When used improperly, distracting vocal mannerisms that sometimes creep into speech can have a negative impact on the call and can leave customers dissatisfied. This course will help agents become aware of the most common speaking distractions and give specific tips and techniques for improvement so they can communicate with confidence. Agents will gain an understanding of the seven vocal elements and learn how to improve each one so their voice becomes a finely tuned instrument that helps make a postive impression on every telephone call. Effective vocal warm-ups that maximize the clarity of their voice. To identify and eliminate frequent verbal mishaps and “verbal viruses”. How to correct problems with vocal volume and tempo. How to find the optimal telephone voice pitch. To change their voice inflection in order to sound more upbeat, energetic and enthusiastic. In this module, we'll test your knowledge of the key learning points from Vocal Makeover. To score a passing percentage of 80%, you must answer 10 of a possible 12 questions correctly. Good luck! We offer bulk discounts for orders containing 5 or more seats for a program or bundle. Check our pricing options for First Class Phone Skills below. If you apply for bulk pricing, please contact us to place your order. The First Class Phone Skills program is designed by call center experts to provide a practical and engaging learning experience. Start today.